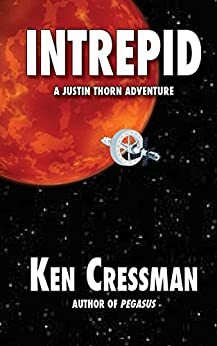 Ken Cressman’s book, Intrepid, is a futuristic adventure set mostly in space. We follow main character, Justin Thorn, and his engineer friend, Steven Wilson, as they take on a mission they never could have seen coming. Wars have broken out over race, religion, and even sports teams, dividing the United States. Martial Law has been declared. Military branches have dissolved, and the leftover scraps have been joined together to form the Military Defense Force. Justin, a former MDF pilot, has an anti-gravity capable ship named Pegasus pieced together from former military aircrafts, and the feds want it. Justin won’t let his ship leave without him. He volunteers to set out toward Mars. The mission is unclear. They will either fix faulty communication devices, rescue the nine people on the planet, or retrieve bodies. One of the nine is Justin’s ex and the love of his life, and all they know is there has been no communication between Mars and the Space Agency for months. This is an edge-of-your-seat kind of book. Whatever can go wrong, does go wrong. A whole different set of obstacles is present during space travel than here on earth. Gravity, anti-gravity, air pressure and breathability, depleting food and fuel levels, meteor showers. It seems like every time things start going smoothly, something goes catastrophically wrong. Between Justin and Steven, they might as well have MacGyver on board though. They put their heads together to take on every problem that arises. The problems leave you woeful for the exhausted characters, but it keeps the excitement high. Risks are high, but so are rewards. Justin is a loveable character. He is sort of a self-made man. He was a pilot with the military, but is now self-employed. He has taken advantage of the latest technology, and has built a ship equipped with anti-gravs (anti-gravity). He basically has formed a transport service, zooming goods around the globe. He does have space experience, and that comes into play when the Mars mission presents itself. He is also loyal. He doesn’t want to take the job if it means leaving Steven, his engineer and general know-it-all and problem-solver, behind. He also feels the need to be part of the team that goes to check on Kelsey, a member of the Mars research team who is also his former girlfriend and current love. Justin bravely puts his life on the line more than once for the good of the crew and the mission. The book is packed with cutting-edge futuristic technology. Maia is also on board. Maia is an artificial intelligence computer system. Maia is ever-present and a pivotal tool when obstacles arise. Cressman does an excellent job of explaining the more technical parts of the book, including Maia. Technological advances are broken down where someone who is not scientifically or technically inclined can understand everything easily. The element of the unknown also plays a big role in Intrepid. Space is vast and unimaginable without a million problems. The crew has no idea what they will find when they get to Mars. Will the research team all be dead? Will they find anything at all? Will there be a simple fix to their communication equipment? Will they walk into some sort of ambush? Will anyone make it back to Earth alive? 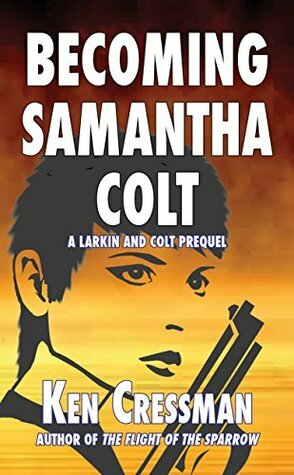 The reader will find themselves questioning every next step as they follow the crew on their mission. Ken Cressman makes everything so relatable and readable. It is technical at times, but the technology is effectively explained. I was all but biting my nails as the story progressed. I’d like to read more Cressman work. Pegasus follows captain Thorn as he and his crew embark on a fateful trip that will leave their ship sabotaged. What were some themes that you felt were important to highlight in this story? 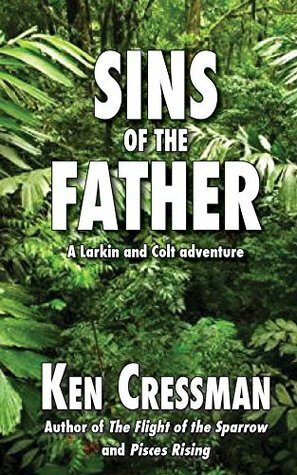 This story is set about a hundred years in the future after a series of global conflicts that has destroyed governments and devastated the natural environment. But it’s not a bleak, dystopian future. My main viewpoint was that after things settle down, the Earth begins to heal itself and the survivors find a way to work together to make the world a better place. But people being people, there are still those who want to exploit the environment for their own gain. This is what’s happening on the moon, and it’s the discovery of this damage that drives the story. At one point, Thorn is standing on the moon looking at Earth; this beautiful, fragile, and completely unique jewel in the vast blackness of space, and he realizes how precious it is. It’s the only home we’ve got, and we’ve got to protect it. The theme is further explored on a smaller scale as this crew of very different people realize they have to work together if any of them are to survive. Thorn is a laid back, hard-on-his-luck man full of quirks and a relatable backstory. Was there someone that served as inspiration for his character? How did he change as you wrote the story? This is the first in what I hope will be a series of books. In my other series, David Larkin is the nearly perfect hero; smart, strong, brave, and almost always right. My wife observed that Larkin is who I want to be, and Thorn is who I really am. She might have a point. Thorn doesn’t consider himself a hero; he’s just a guy trying to do a job. He is sometimes selfish, sometimes cranky, and resentful of these people he’s forced to live with in a very confined space. But over the course of the story he comes to appreciate the different skills that these people can contribute to their mutual survival, and when he loses a crew member, he is truly touched and deeply saddened. Steven Wilson, a huge part of the success of Justin Thorn’s mission, is a character I would like to see further developed. What was your initial idea behind his character and where do you see him going in the future? Thorn readily admits that he doesn’t have a lot of technical knowledge, and Steven contributes skills that Thorn lacks. He’s a bit of a geek, very smart, with a lot of knowledge and a creative way of applying it. He’s the brains of the outfit. In their second adventure together, Steven will once again find a creative solution to a life-threatening situation to hopefully save everyone. My next book is entitled Intrepid, and this time Thorn and Steven are going to Mars to attempt to rescue the scientists at the outpost there. But when they arrive, things go horribly wrong and the survivors must find a way to get their crippled ship back to Earth, millions of miles away. It should be out by the end of the year. Captain Justin Thorn is hired to transport equipment and supplies to a mining colony on the moon. When they arrive, Thorn and his crew discover a shocking secret that could jeopardize all life on earth. On their return ship they find that their ship has been sabotaged, leaving them unable to return to Earth without burning up in the atmosphere. Trapped in orbit and with time and air running out, they attempt a daring maneuver that could either save their lives or kill them all. 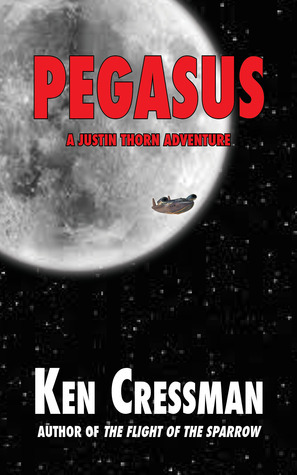 Pegasus, by Ken Cressman, is the story of Justin Thorn’s revelations about a mining company working from a base on the moon and the fateful trip endured by his crew of five unlikely and unassuming heroes. Thorn himself is a laidback, hard-on-his-luck man given to long stretches of solitude. When he is offered a single job transporting cargo to the tune of six months’ his normal income, he is unable to turn it down. As he assembles his crew and prepares for their journey to the moon, Thorn cannot fathom the ways in which his life and the lives of his crew will change over the course of what is supposed to be a ten-day venture. Cressman, as always, has handed readers a memorable main character full of quirks with a relatable backstory. Justin Thorn, throughout this first-person narrative, reveals much about his fears and suspicions in addition to regrets about his history with Kelsey, his lost love. I found myself rooting for a Justin and Kelsey reunion from the first mention of her name. As I continued to read, however, I believe Justin’s lone wolf type character is much more suited to the vagabond lifestyle with no romantic ties. Cressman has drawn his main character exceptionally well. I am always amazed at the amount of technical knowledge Cressman incorporates into his plots. What I find more astounding is that he manages to successfully describe complicated procedures with ease for even the most clueless reader. Cressman is a master at making these aspects of his writing readable and enjoyable. I am always able to successfully visualize his characters’ technical challenges. Steven Wilson, a huge part of the success of Justin Thorn’s mission, is a character I would like to see further developed. As far as the ins and outs of flight and space travel, Steven is the brains of the operation. His backstory involves an inordinate amount of time sustaining himself on library books during the Armageddon-type setting of his youth. He is self-taught, self-assured, and dead-on in all his predictions. He could easily grow into a regular character. The imagery created in Pegasus is quite stunning. Justin Thorn reveals bits and pieces of his past and describes both a commune and a scene rivaling any dusty and dried up town in the old West on the verge of becoming a ghost town. Where his characters also describe the invention of anti-gravity units powered by sapphires and ships owned by private citizens equipped for multiple trips to the moon, Cressman keeps things grounded with snapshots of struggles here on Earth following the collapse of nations as we know them. 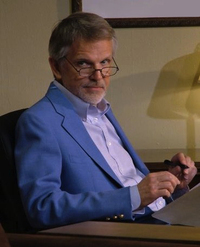 Cressman offers a science fiction piece for both fans of the genre and readers who may wish to experiment with something outside their comfort zone. The author ties up loose ends quickly in less than 200 pages but does seem to open the door to more books with Justin Thorn and his beloved ship, Pegasus.